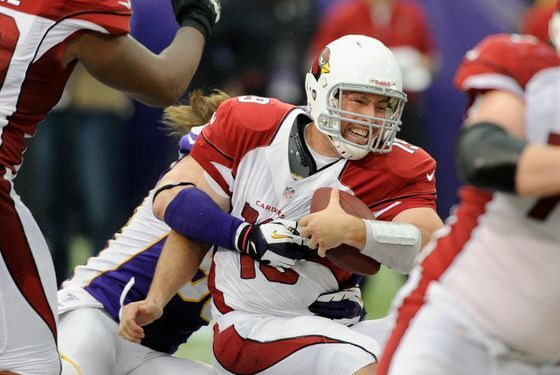 With Kevin Kolb sidelined with an injury, John Skelton — the Sports Section's Official Favorite Athlete for reasons explained here — is once again a starting NFL quarterback. So, how'd it go yesterday against Minnesota? Well, he was sacked seven (!) times, and while under pressure early in the third quarter with his team down by seven, he threw an interception that was returned for a Vikings touchdown. (His final numbers in the Cardinals' 21-14 loss: 262 yards on 25-for-36 passing, a late touchdown, the one interception, and a lost fumble.) And with Kolb out for the time being, at least one observer wonders if rookie Ryan Lindley might get a chance to start soon if Skelton doesn't play better. Arizona next plays one week from today, when they'll host the 49ers on Monday Night Football.